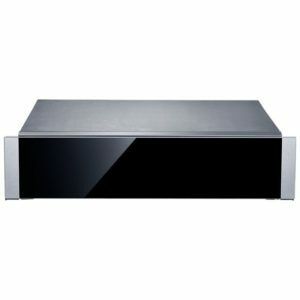 This superb Chef Collection warming drawer from Samsung is 14cm high and is finished in stainless steel and black glass. It is perfect for warming food or crockery. 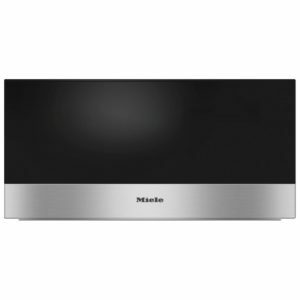 This superb 29cm high handleless gourmet warming drawer from Miele is perfect for low temperature cooking, and is much more than just your typical warming drawer. Thanks to its four operating modes this warming drawer has multi-purpose use, warming cups and plates, keeping food warm or cooking at low temperatures. Cooking with low temperatures allows for meat recipes to automatically become specialties, giving perfect results. This drawer has a Push2Open mechanism for easy access at the lightest touch. It also has a convenient, easy to use programme selection via a flush touch panel. All of Miele’s built-in food warming drawers feature a 4-hour timer which switches off automatically for safety. 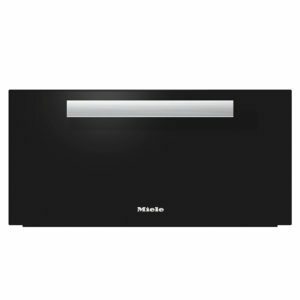 Finished in Miele’s stunning Obsidian Black, this gourmet warming drawer is the perfect addition to your kitchen, especially when teamed up with other PureLine appliances. This superb warming drawer from Miele is finished in stainless steel. It is perfect for warming crockery. 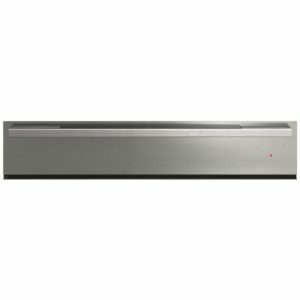 This superb warming drawer from Fisher & Paykel is 12cm high and is finished in stainless steel. It is perfect for warming food or crockery. This brilliant warming drawer from Neff is incredibly helpful to have in your kitchen. Designed to match other items across Neff's range, it is a fantastic kitchen aid. Warm your plates before serving, defrost snacks or even gently melt food; there's more than meets the eye! With a handy anti-slip mat included and room for up to 64 expresso cups or 14 plates, you will wonder what you did without it! 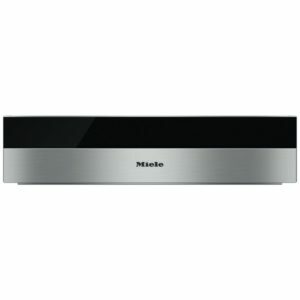 This superb warming drawer from Miele is 29cm high and is finished in stainless steel. It is perfect for warming food or crockery. This brilliant warming drawer from Neff is small in size but offers plenty of handy features! Warm your plates before serving, delicately thaw and even prove dough, you will be delighted with the results. With space for up to 30 plates and clever Push-Pull opening it offers plenty of room and easy use. 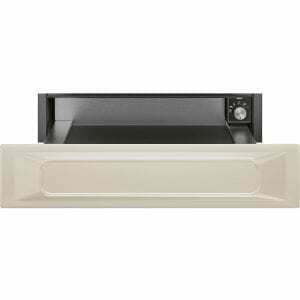 This fantastic warming drawer from AEG is ideal for warming plates, keeping food warm and even letting dough rise. With a fan to actively circulate air, the interior stays evenly warm. With room for up to 6 place settings and an anti slip mat inside, you can pop in plates, dishes, cups - whatever you need to keep warm. Finished in anti-fingerprint stainless steel, this warming drawer matches perfectly other items across the range. This superb warming drawer from De Dietrich is 14cm high and is finished in black. It is perfect for warming food or crockery. 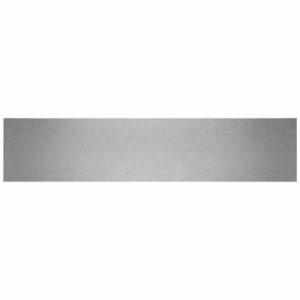 Finished in stainless steel, this 29cm warming drawer will fit in up to 12 place settings, for perfectly warm plates before serving up. Fan circulated air keeps an even temperature, and you can also use the drawer to keep your food to temperature and even prove dough. The KDE912922M looks brilliant paired with other appliances across the range. This Smeg warming drawer is part of the classic Victoria range. Measuring 15cm high it is suitable for fitting directly beneath a 45cm high compact oven. The push-pull handleless opening drawer provides a streamlined look without bulky or unsightly handles getting in the way. Temperatures can range between 30-80°C inside this warming drawer making it perfect for gently warming food or crockery. Finished in cream, it would make a stylish addition to any Smeg lovers kitchen! This superb warming drawer from De Dietrich is 14cm high and is finished in white. It is perfect for warming food or crockery. This superb Linea warming drawer from Smeg is 15cm high and is finished in white and supplied with a non slip liner. It is perfect for warming food or crockery and is a great match with other Smeg appliances across the range.